A pint-sized parrot! The tiny Spectacled Parrotlet, about the size of a sparrow at only 12 cm long, is Panama’s smallest psittacine. In addition to its tiny size, the Spectacled Parrotlet is generally a dull green overall; the male has bright yellowish-green forehead, cheeks and throat, with bright cobalt blue on wings and rump and around its eye, giving it its name. The female is dull green overall and lacks the blue around the eyes. They have a short, wedge-shaped tail. Spectacled Parrotlets are highly social and can be found in groups of up to 100 or more individuals! They forage together for small fruits; they can sometimes be seen foraging in grass on the ground, a behavior unique among parrots in Panama. Their call is a high-pitched chittering with intermingled buzzy notes. Due to their small size, they can be difficult to see when perched in treetops; however, they do often perch on exposed branches. 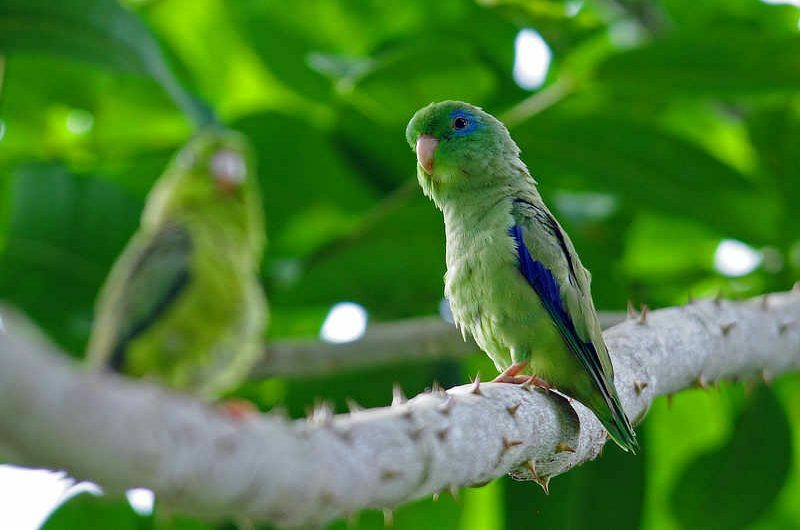 Spectacled Parrotlets are found in dry to moist tropical forest habitat, forest edge and open areas from eastern Panama to northern Colombia and extreme western Venezuela. They are uncommon in the lowlands of Darien, and are one of our target birds during a stay at Canopy Camp Darien.